Kalanchoe fedtschenkoi growing succulent subshrub of the genus Bryophyllum also known as Bryophyllum fedtschenkoi, Kalanchoe fedtschenkoi perennial evergreen used as ornamental ground cover drought tolerant plant, can grow in desert, subtropics, mediterranean climate and growing in hardiness zone 10-12. Leaves color green some variety red or white in the edge of the leaves, leaf round shape and sometimes lobed in the margin. 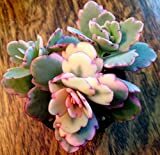 Kalanchoe Fedtschenkoi, Exotic Rare Succulent Plant Cacti Cactus Bonsai Outdoor Agave 2"